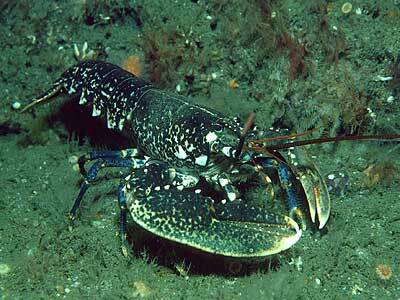 Description: The lobster is a familiar crustacean to most people. In life they are blue in colour, with large claws, eight walking legs and a long body ending in a series of tail plates. Habitat: Lobsters are most common in the infralittoral zone amongst boulders, but occur at all depths on rocky seabeds where they can find some shelter. Distribution: A common species all round the coast, though in most areas numbers are seriously depleted by fishing. Similar Species: The only other large crustacean with a similar shape is the crayfish Palinurus elephas. Two large claws, one a cutter and the other a crusher. Picton, B.E. & Morrow, C.C. (2016). Homarus gammarus (Linnaeus, 1758). [In] Encyclopedia of Marine Life of Britain and Ireland.